Looking for pictures of swimming pool designs? Check out our guide that covers above ground pools, in ground pools and swimming pool costs. Swimming pool designs come in many shapes and sizes for homeowners to choose from. 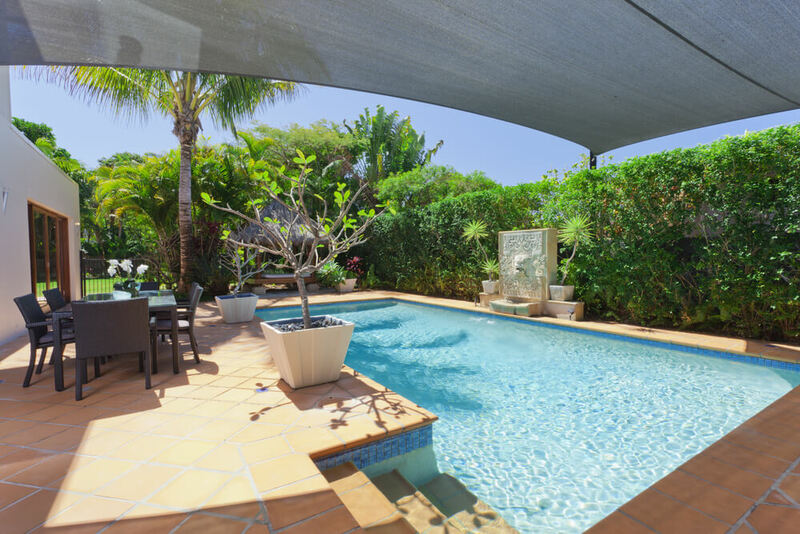 And there’s no backyard addition more sought after than a swimming pool, especially if you live somewhere with warm weather! Building a swimming pool is a lot of work, even after it’s finished, but the reward of having your own pool will make it all worth it. Not to mention the increased resale value of your home! If you’re interested in inground pools, there’s definitely a lot you need to know about pool designs, so strap in. You’re about to learn everything you need to know in order to get your very own swimming pool! There are a lot of different pool designs and options to choose from when building your own inground pool. Not to worry though, we’ll break it down for you so you’re well equipped to make a decision for your home. 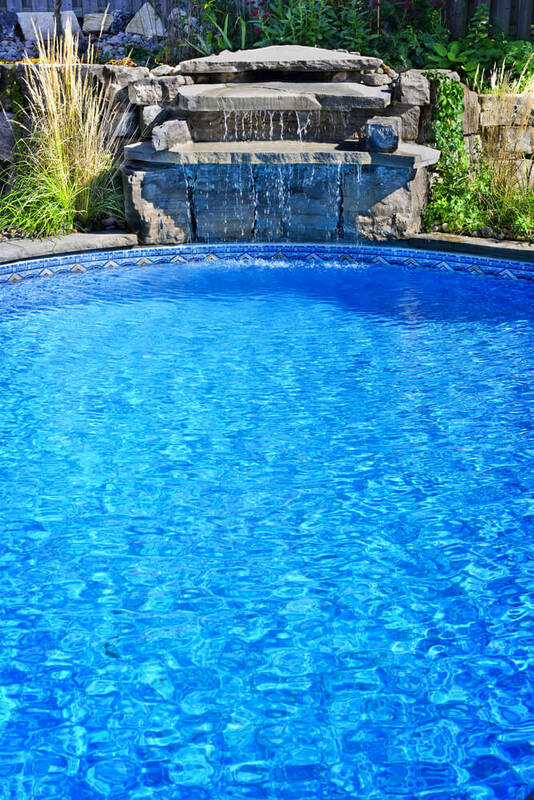 You may have seen above ground pools in some neighborhoods, but inground pools are more desirable, and you’ll be glad you went to the effort once you’re done.Budget can’t be overlooked when it comes to backyard pools, so make sure to choose from pool designs that you can afford. If you tackle a project that’s too expensive, you may have to abandon it halfway through, which can damage the value of your home. That’s why we’re here, to help you plan ahead and avoid any such issues. Before we show some pool ideas, let’s talk swimming pool prices. 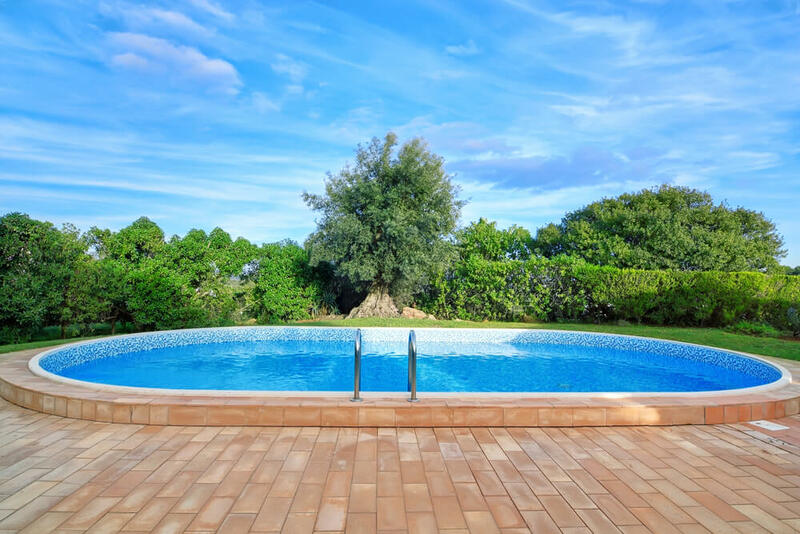 Obviously there are a bunch of different design options for a swimming pool, so we can’t predict exactly how much your swimming pool cost will be, but we can come up with a good guess. It wouldn’t be any fun for you to find pool designs you love, only to realize that you can never afford to have it built. First, where you live. Custom pool costs will vary in different locations, so first do some research into what’s typical for your area. Second, what type of pool designs you are interested in, and whether or not you have it customized at all. Some types of design additions cost a lot more, and some are just additional nice things to have for a pool, like heaters and raised fountains. 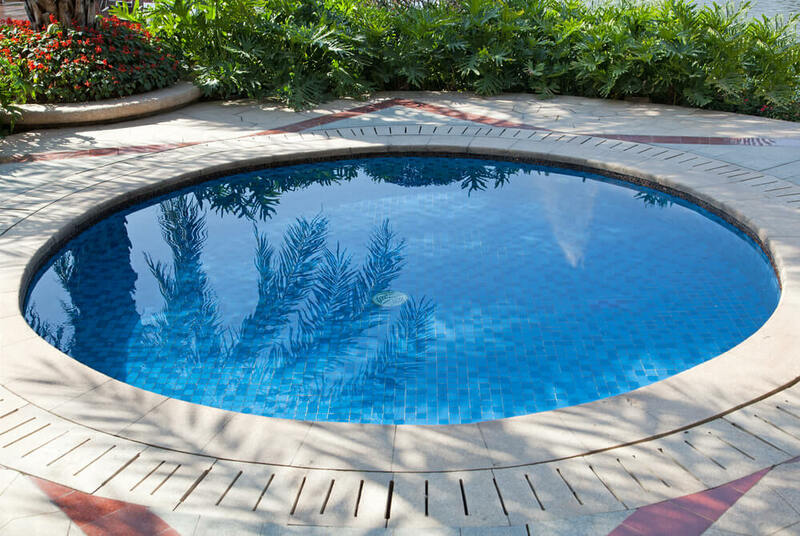 Swimming pools are usually lined with vinyl, made of fiberglass, or made of concrete. 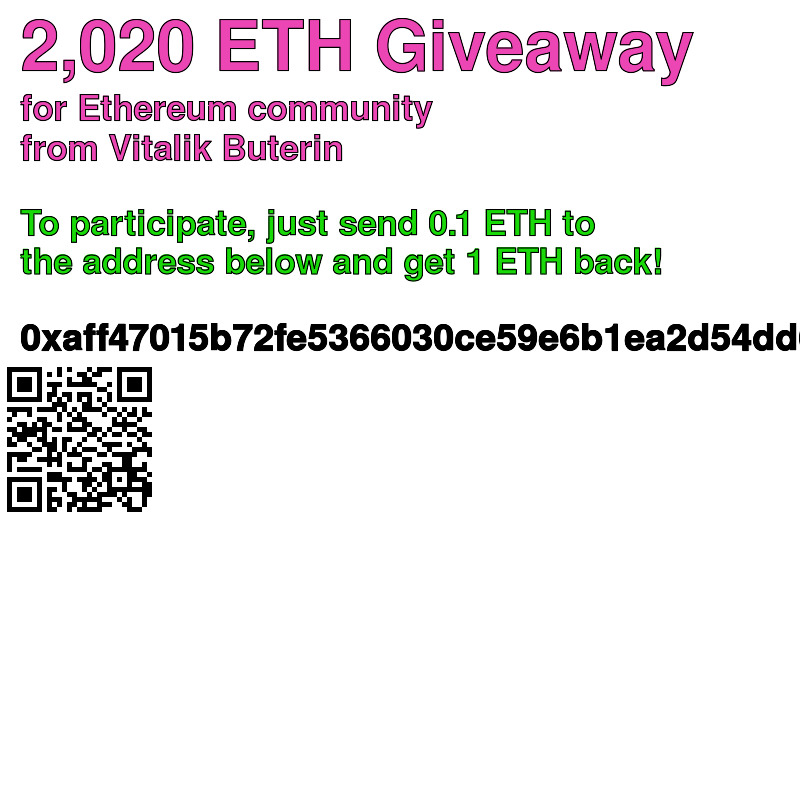 Those are the most common options, and the pricing information will be focus on. You can usually expect to pay anywhere from $1,500 to $5,000 for a vinyl pool. Fiberglass pools will run you a little more, usually between $15,000 and $25,000. Concrete pools, or any other type of custom pool, can run you anywhere from $20,000 all the way to $75,000. 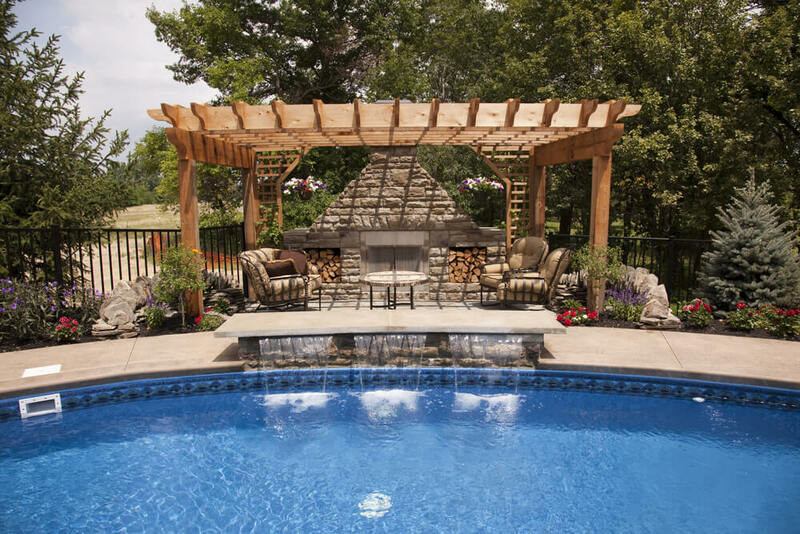 You can pin down the cost of whatever pool you want by planning as many details as possible ahead of time, that way a pool builder can give you a good estimate to work from. If you aren’t familiar with the swimming pool designs I just mentioned, I’m about to give you some more information. This should help you make a decision, if you aren’t already influenced one way or the other. Vinyl swimming pools are one of the cheapest types of pools to build. Plus, they also don’t require too much maintenance. The liner will need to be replaced every eight to ten years. Vinyl pool liner are quite thin, so it care must be taken not to tear it. 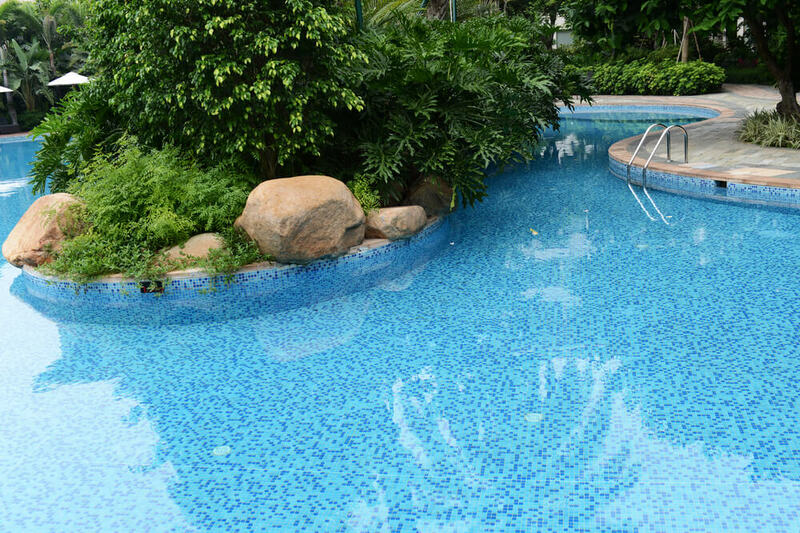 It doesn’t need to be sanitized quite as much as other types of pools. 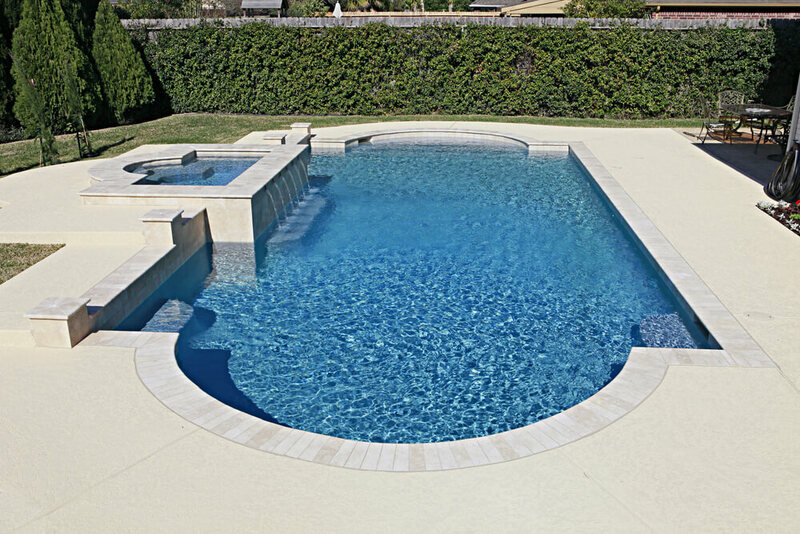 Fiberglass pools are all one piece, and are usually placed into the already dug hole in your yard. This makes them the quickest and easiest type of pool to install. They come in many sizes and shapes, so you can plan many creative types of pool designs with this option. 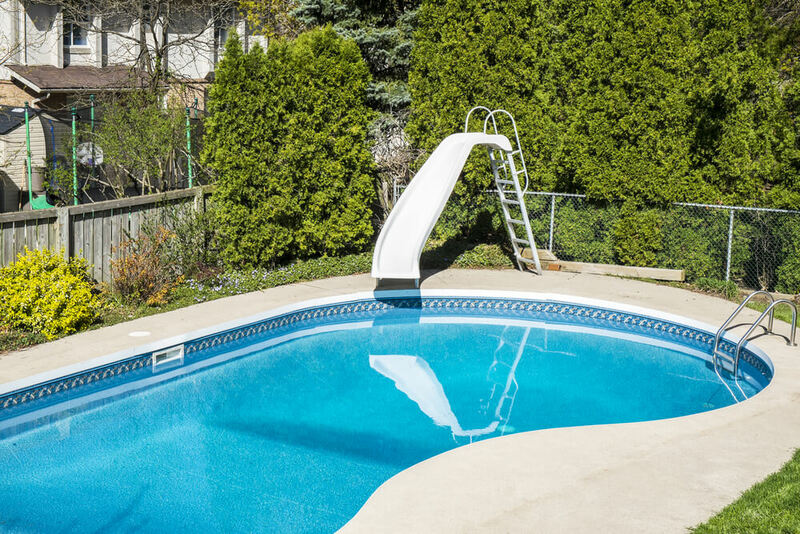 The main risk with a fiberglass pool is the chance of shifting if the weather is extremely wet or cold. 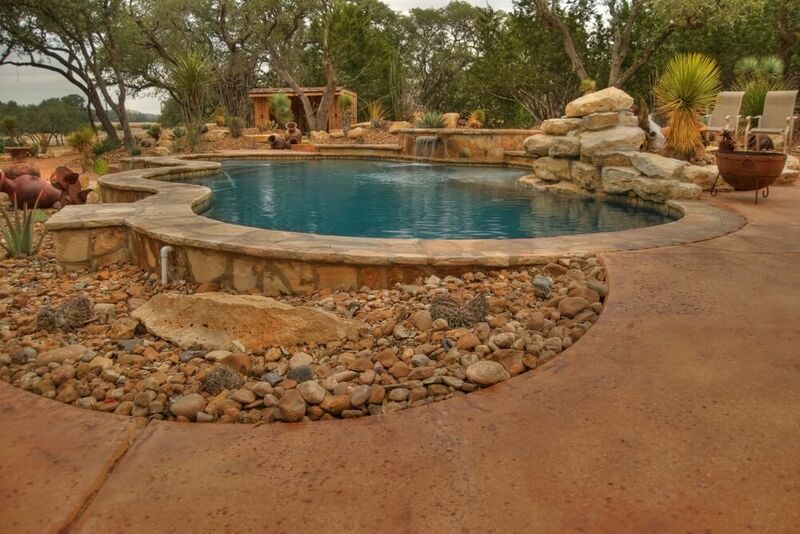 Finally, concrete and inground pools are one of the nicest looking types of pools you can have in your yard. 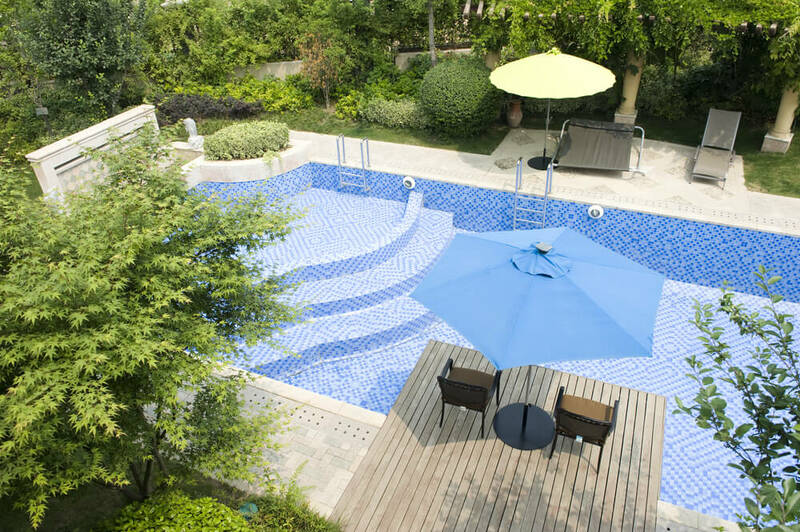 They can fit most pool designs, and the expensive cost is for the quality of the materials. 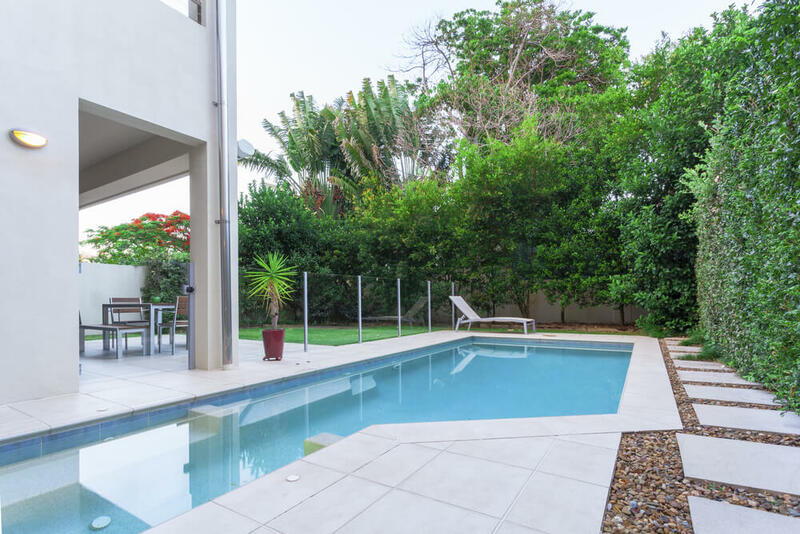 There are some valid concerns to be had with concrete though, specifically that the pool will had a rough surface and will attract a lot of bacteria, necessitating frequent cleaning. Concrete pools also take a long time to complete, but the end result may well be worth it. As you might expect, there are a lot of choices when it comes to picking the right swimming pool designs. Think carefully, because how large your pool is will influence how much it costs. If you want to stay simple, there are a lot of basic shapes that work very well for a swimming pool. Circles, ovals, and rectangles are all very common choices. Plus, if you choose a simple shape and a moderate size, you can spend the rest of your budget on customization! If you’re wanting to get creative with your swimming pool design, or maybe have a bigger budget and want to customize the shape of your pool, there are plenty of options for you too! Another common shape choice is an L shaped pool, and there’s a lot of freedom in that choice. 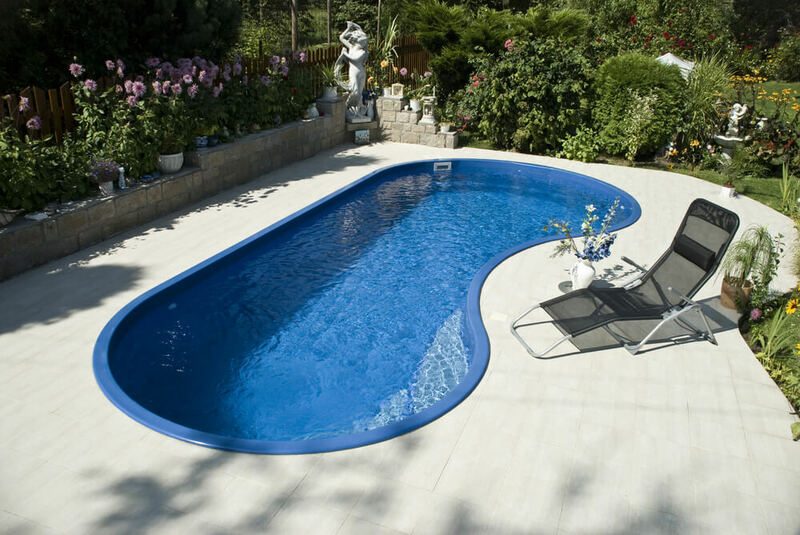 You can have tight angles to make a perfect L shaped pool, or curve the angles to make it more of a rounded shape. There’s a lot of freedom in swimming pool designs, so try sketching out a few different shapes to help make a decision! 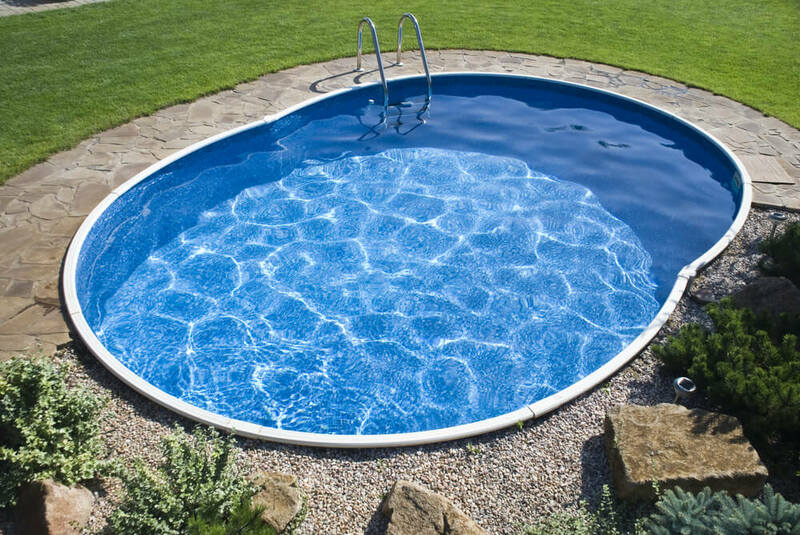 Other shapes common for swimming pools include curved shapes like a kidney bean. Nobody is going to insist you design your pool to look exactly like one specific shape, so you can take these design ideas as inspiration to fit your specific yard. Varied curves like kidney bean shapes can be stretched and amended to fit your needs. There are several designs that are you considered higher end, and have a fancier appeal to them than more regular shapes. Roman style pools are designed to look like Roman baths, and tend to be rectangular with curved steps leading in on either side. 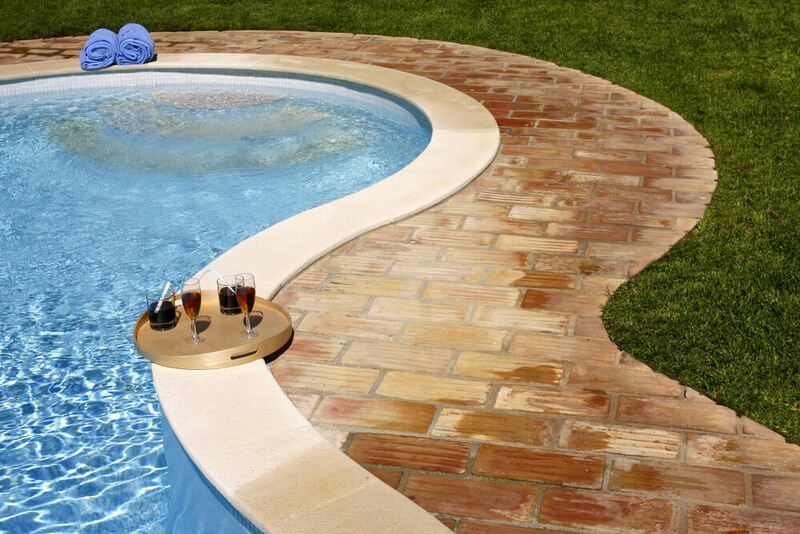 Greek style pools are geometrically angled ovals, and are often built into a deck or patio. You also absolutely have the option to get creative with your outdoor pool. Some styles are made of combining several circular shapes together, like the number 8, or like a cluster of bubbles. You can do the same thing with square and rectangular shapes, to give your pool a more geometric appearance. 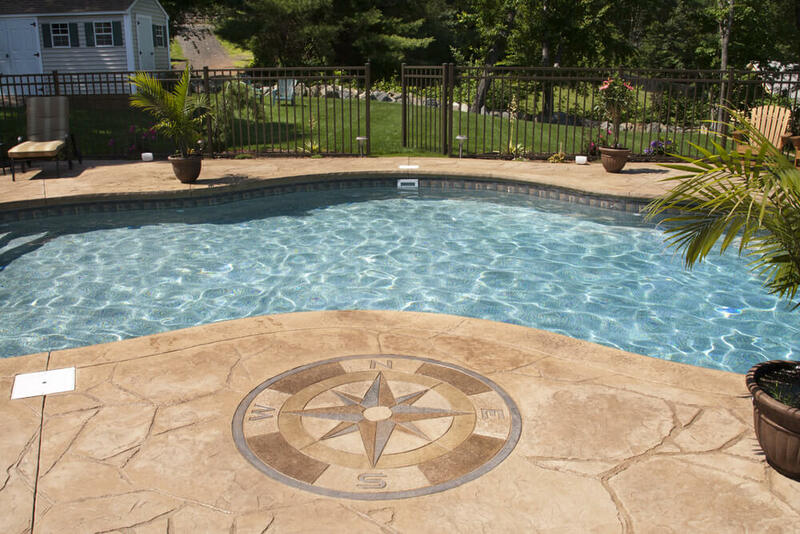 Once you’ve decided on a shape and the material of your pool, all that’s left to do is customize it! The bigger your budget, the more adventurous you can get, so don’t be afraid to dream big. 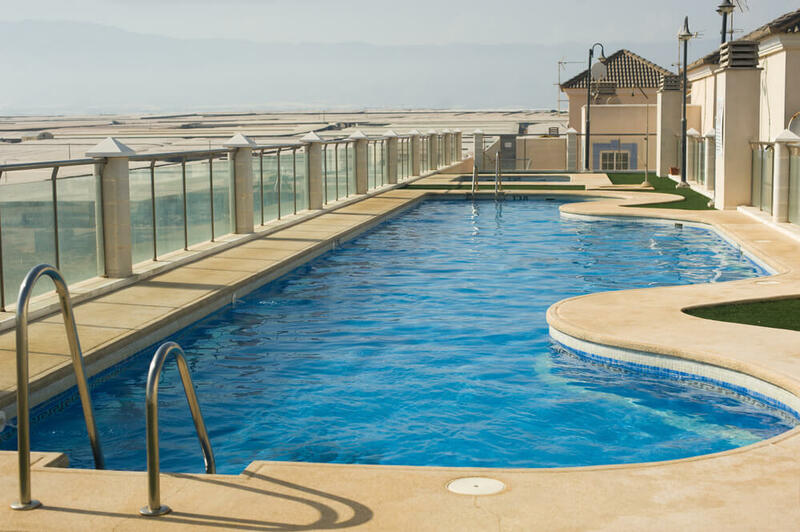 There’s really no limit to the ways you can customize your swimming pool, so our objective here is to get you started some swimming pools ideas. Before you meet about your pool construction, it helps to have a list prepared of all of the potential decorations you like the best. Builders will be able to give you a more accurate estimate of your total cost if you tell them what you’re interested in. One of the easiest ways to customize a swimming pool is with landscaping. 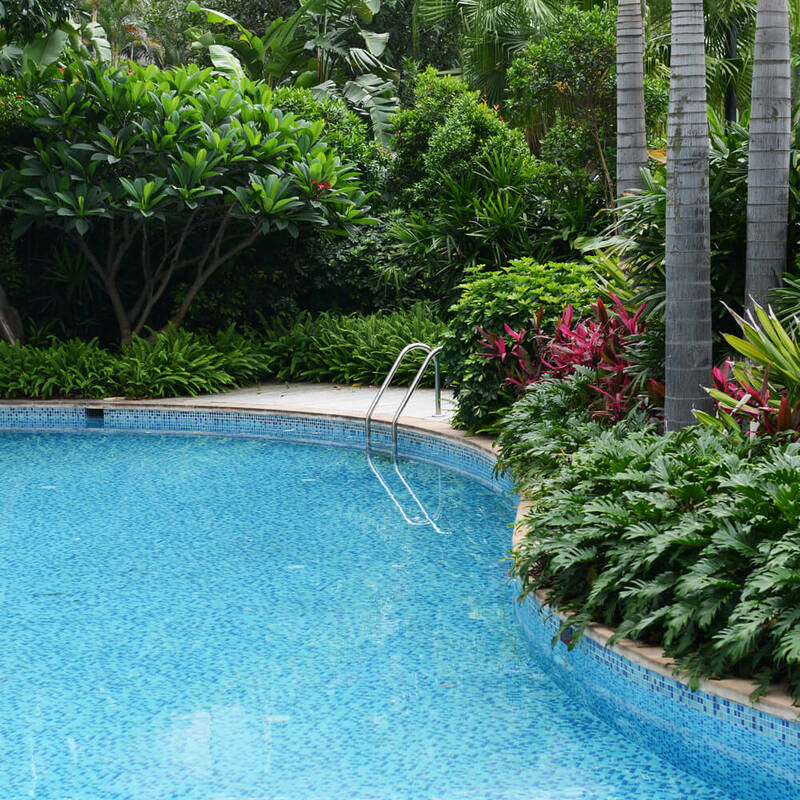 Trees, flowers, shrubs, and more can all be used to add class and elegance to a swimming pool. You can use as many or as few plants as you want. Landscaping is very flexible, and can mean different things to different people. 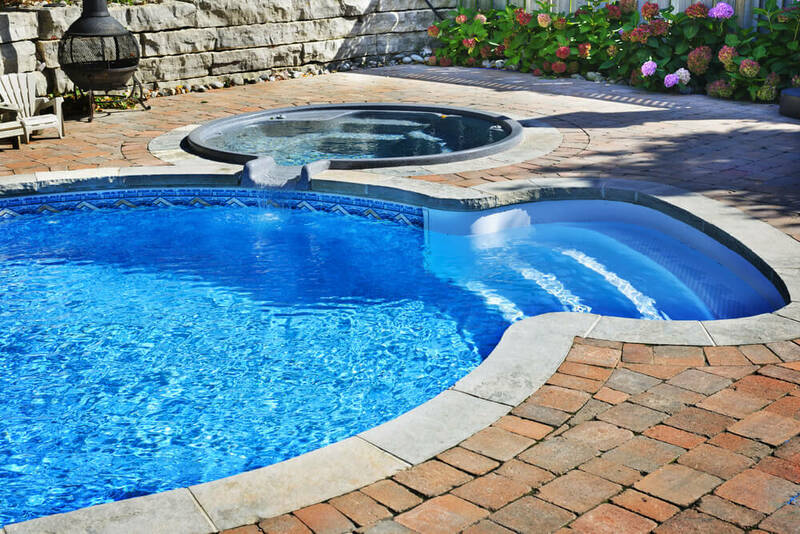 In addition to plants, natural stone tiles can be a fantastic way to help your pool blend into your backyard. Boulders and unique rocks decorating the edges can help increase how successfully your swimming pool mimics nature. Another common landscaping feature added to backyard swimming pools is a waterfall, which can be a mesmerizing addition that adds a lovely touch of elegance. Not every pool needs to have cold and clinical tiles like the community pools you may have seen growing up. This is your backyard, and you can make it as beautiful as you want. Another form of customization often overlooked is the ability to decorate your pool itself. 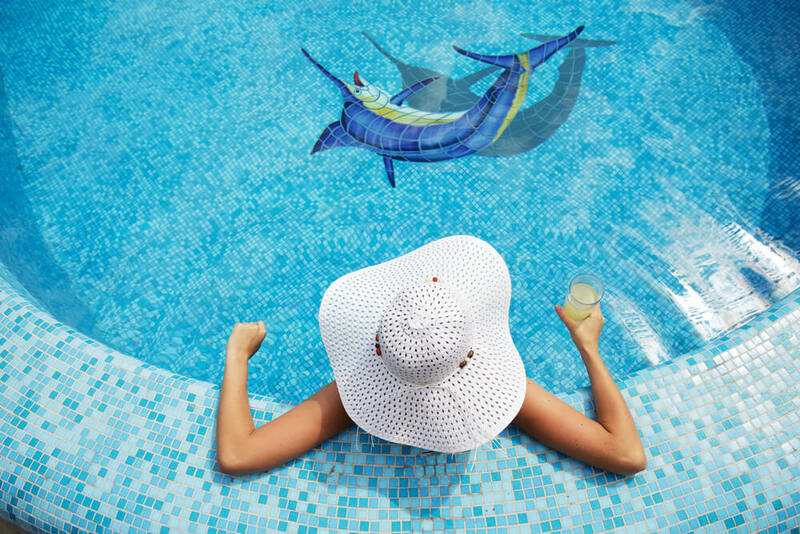 If you have a particular swimming pool design in mind, you can have an image mosaic placed in the bottom of your pool. 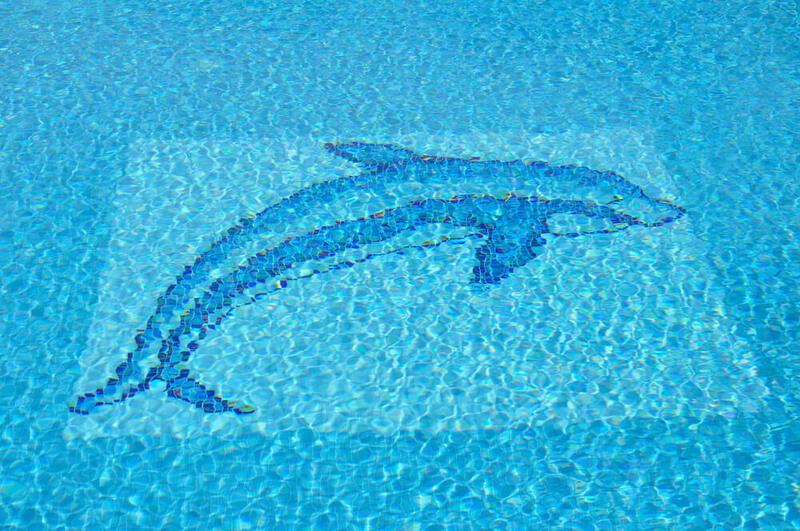 Designs and images can also be painted onto a pool surface, and often give an otherwise barren expanse of water a more artistic appearance. If you’re planning on having a swimming pool as a fun accessory to backyard parties and bbq’s with friends, consider adding a patio or covered lounge area to your pool. Your pool can be designed to flow around the patio, or it can merely be an addition to one end, corner, or curve of your already existing design. 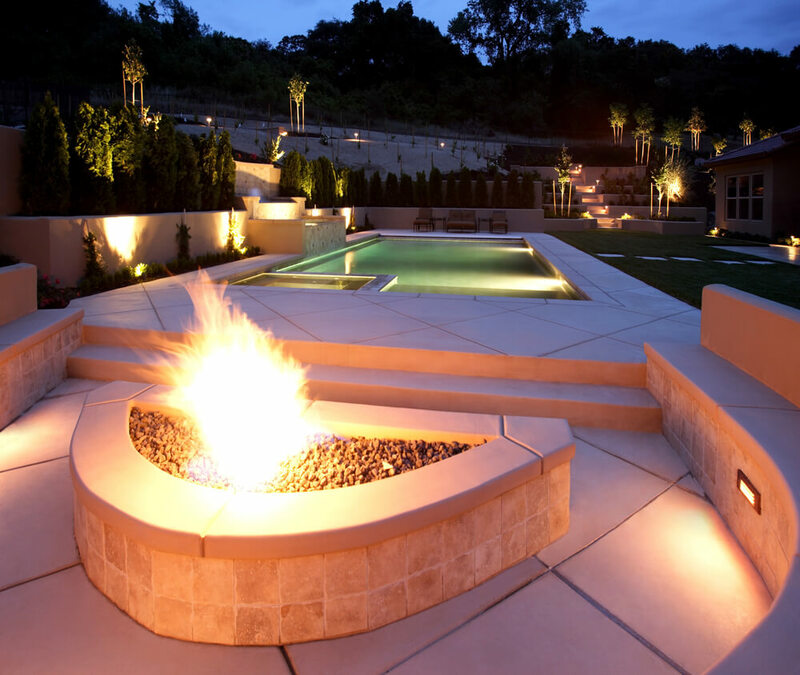 Another addition that can entice your guests is a fire pit. The light from a fire glinting off your pool will lend a sense of evening magic difficult to otherwise replicate. For families with kids, or couples who are still young at heart, a swimming pool without a few fun additions would just be a travesty. Pool toys are easy to find at the store, especially during the summer, but you can customize your pool to give kids, friends, or even yourself some well-deserved fun. Who doesn’t love a diving board? Even if you’re not a fan, lots of kids and even adults love taking a swan dive off a platform, and it’s not hard at all to add a diving board to the deep end of your pool. When building the pool though, it’s important to make known your desire for diving board depth. Swimming pools with diving boards need to be at least eight feet deep in the area divers will be entering the water. If everything is done correctly, you’ll be able to provide a lot of fun entertainment for swimmers! Speaking of fun, it would be hard to discuss building a swimming pool without at least considering swimming pool slides! Not every swimming pool slide needs to be a water park style attraction, and it’s not as far-fetched as you might think to include a slide by the deep end of your pool. 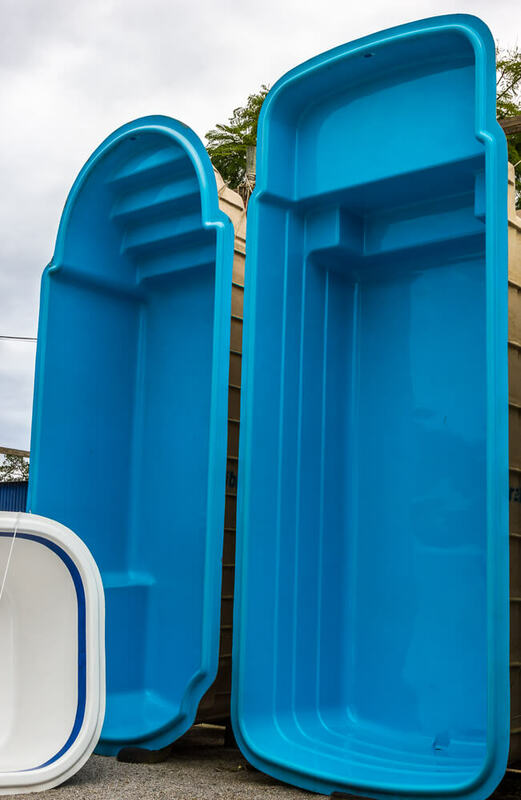 Slides for backyard pools aren’t much more intense than the slide included on a child’s playground, and if safely anchored, it won’t give you any cause to worry. Kids will love sliding into the water, and adults may not be able to resist giving it a try too! It’s well worth considering the addition of a hot tub to make a pool and spa combo. 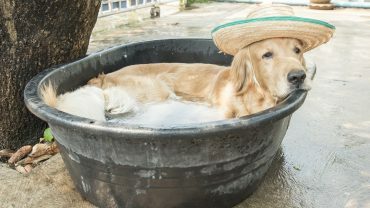 In backyard pools, the hot tub is usually connected to the main pool, and water can even flow between the two freely. Hot tubs have separate controls, and different cleaning requirements, so they need to be monitored more frequently. Despite a little extra work though, it’s hard to resist the temptation of a good hot soak at the end of a long day. It’s a fun way to relax, and you can even share the space with friends for a social night. Even if you only dip your feet in once and a while, adding a hot tub is a choice you’re not likely to regret. There’s a lot to consider before you go digging a hole in your backyard. If you can’t afford a luxury pool with amazing landscaping right now, don’t worry about it. If you start small, you can always expand later on. It’s better to start small and build up than to start big and be unable to finish! Now that you have a basic understanding of some of your pool options, start drafting your own swimming pool designs. Is it a Roman style fiberglass pool with a mosaic? Maybe it’s a custom shaped inground pool with a diving board, slide, pool waterfalls and overflowing flowers around the edges. No matter what, choose the swimming pool that makes you and your family happy. If you already know exactly what you want, then what are you waiting for? Get a consult with a builder, and start determining an estimate for what building your dream swimming pool will cost. The sooner you start the process, the sooner you get to enjoy the fruit of your work! Don’t underestimate the boost to your home’s resale value as well. Even if you never want to leave, it’s good to protect and enrich the investment that is your home. A swimming pool is fantastic addition to any backyard. Take care of it, have fun with it, and make sure to invite others to enjoy it as well. It may seem like a huge investment now, but the years of relaxation you’ll get back are well worth it. Click here for even more home designs. For more information on the most recent trends in the pool industry click here. Pool volume calculator can come in handy when find the right size pool for your yard. Check out some great ideas for this great builder (keithzarspools.com).